Have you been wondering (or wishing) if your investments could have done better in 2018? If so, you aren’t alone. Our markets have been giving most investors a real struggle for the past couple of years. Meanwhile, for those people using the AIM investing method, there have been great things happening! If you ever wanted to become a successful AIM investor yourself, there are only a few more days to do that at our current fee of only $200 for 6 whole months of advising. 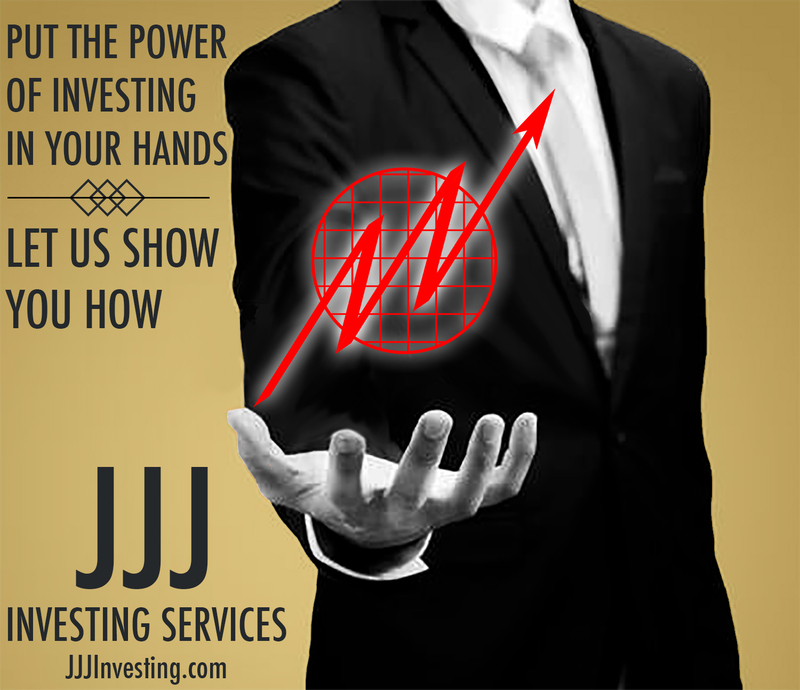 Due to increased demand for our personalized investing advice and coaching with the Automated Investing Method (AIM) and long term options (LEAPS), JJJ Investing Services is increasing their client rates as of February 1, 2019. The AIM investing method is a proven, scientific method to buy low, sell high, and earn profits over a lifetime. It was first developed by Robert Lichello over 40 years ago. For over 30 years, Jeff Weber has been using and improving the system. As subscribers to his monthly newsletter know, he has been sharing and teaching this knowledge to many others along the way. The most dramatic improvement came when Jeff applied the AIM system to long term options or LEAPS. Due to the increased volatility and higher fluctuations of options, any method that takes a scientific and automatic method to profit from the inevitable ups and downs of the market will obviously be much more effective with options. In 2018, clients of JJJ Investing Services experienced a dramatic increase in value, benefits, and services. As recently featured on our blog, subscriber Brad S. started implementing AIM on one of his retirement portfolios in 2018. 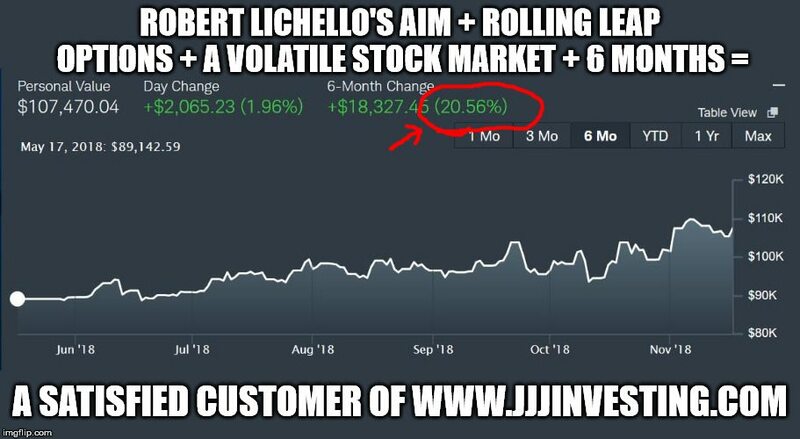 In 6 months, his portfolio increased over 20%. Here is the actual chart he shared with us. Click it to read more on our other blog post. Most investors take the approach of Dr. “Bones” McCoy from Star Trek. They are emotional. Successful long term investors, on the other hand, are like Dr. Spock. They are logical and methodical. The beauty of the AIM system is that it teaches you how to be logical and methodical with your investing. The unique benefit of working with Jeff Weber and JJJ Investing Services is that you get personally taught how to become one of these successful investors. When you have a proven system, taught by a proven investor, the only thing you have to worry about is the time (and money) that you have lost NOT using this system to benefit yourself and your family. If you like the idea of investing for the long haul, how would you like your investment portfolio to have grown 280% over the 10 years that included the dot com crash? That’s how our standard portfolio performed during that period. Suppose you like to stick to the safe and “boring” stocks of the “Dogs of the Dow.” When you have a scientific system to buy low and sell high (as Jeff can teach you with the AIM system), a $60k investment grew to $291,022 for 385% in profits from January 2014 to January 2019! Our mission is to help as many people as possible learn how to use AIM so they can earn a lifetime of profits. But learning this system (and putting it into consistent practice) usually takes personal help. There is nothing like having someone looking out for you and “looking over your shoulder” as a trusted advisor and mentor to make sure you are staying on track. As a client of JJJ Investing Services, you will get our personal help and coaching on all of these items for 6 full months. After many years of using AIM and teaching others to benefit from AIM, we have learned that 6 months is the best minimum length of time to work with people so that they can become self-sufficient and successful AIM investors themselves. Beginning on February 1st, 2019, these will be the new rates for clients of JJJ Investing Services. If you have a retirement account and have been considering the choice to use AIM for your investing, we urge you to contact us BEFORE February 1st, 2019 so you can take advantage of our current rates before these higher rates go into effect. If you are a current client of JJJ Investing Services, this is your opportunity to RENEW UNDER YOUR CURRENT TERMS before these rates go into effect. Contact us now to make those arrangements. To become a successful investor yourself with the AIM system (the Automated Investing Method), take full advantage of JJJ Investing Services while you can. Your portfolio will be very glad you did! Final Reminder – our current fee is only $200 for 6 whole months of working with us to become a successful AIM investor yourself. Compare that to all of the money you’ll make with AIM over your lifetime and it’s obvious why our fees have to increase. But if you start working with us before February 1st, 2019 we will still honor that rate. If you have any desire at all to learn AIM (no matter what size of your retirement portfolio) we hope to hear from you very soon. Jeffrey Weber is not an investment adviser and gives only his personal view and opinion, never making any investment advice or recommendation to buy or sell specific securities. Investors in financial assets must do so at their own responsibility and with due caution as they involve a significant degree of risk. Before investing in financial assets, investors should do their own research and consult a professional investment adviser.